Fourteen-year-old Edith Kachingwe was orphaned when she was just a year old and raised by her aunt. Life has not been easy for her. But lately things have been looking up. In November 2013, Edith won a World Health Organization photo competition, earning her a prize of $1,000 USD. She was the youngest winner, and the only one from Africa. Edith says she took the winning picture for fun and had no previous photography experience. She was introduced to the competition through Dignitas’s Teen Club. Teen Club combines an HIV clinic with a peer support group for adolescents. It offers a nurturing environment where teens can build relationships, strengthen self-esteem and make healthy life choices as they transition into adulthood. More than 600 adolescents participate in Teen Clubs across Malawi. 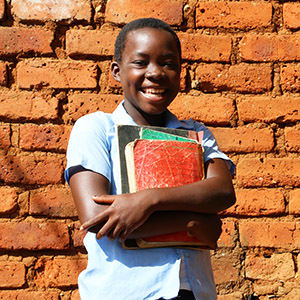 Edith attends school in Zomba. To get there and back, she walks three hours a day. “My ambition is to become either a journalist or a nurse,” she says. Winning the competition has changed the way Edith values herself and how others value her. “My friends at school and in my community say that I am an intelligent girl with a bright future. Even my teachers say so. This assures me that with hard work, I can make it in life,” affirms Edith.